To help educators and librarians to be informed about what their students and patrons are buying from their local comic shops, we present the Top 50 Manga titles for June. Each month, Diamond Comic Distributors announces its best-selling Manga and trade paperbacks based on Total Unit Sales to comic book specialty shops. 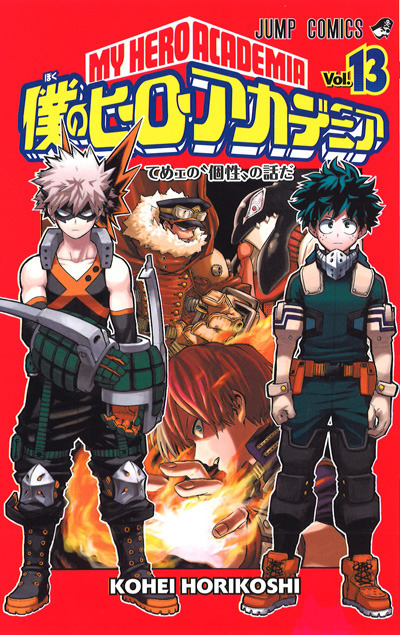 The students of Class 1-A continue to refine their super powers in Kouhei Horikoshi's My Hero Academia Volume 13 from VIZ Media, the best-selling manga title of June. In total, VIZ Media had three titles in the top te, including Tokyo Ghoul:Re Volume 5 at #2 and My Hero Academia Volume 1 at #4. Dark Horse Comics had two titles in the top ten: Usagi Yojimbo Volume 32 at #3 and Gantz G Volume 1 at #6. Also with two titles in the top ten was Seven Seas Entertainment. My Solo Exchange Diary ranked #5 and Captain Harlock: The Classic Collection ranked #7. Kodansha Comics rounded out the top ten with three titles: Battle Angel Alita: Mars Chronicle Volume 3 at #8, Battle Angel Alita Deluxe Edition Volume 4 at #9, and Cardcaptor Sakura Clear Card Volume 4 at #10.